Managing Email from Emacs. Surely that's crazy-talk, but hey… let's give it a try. Before can configure offlineimap, we'll need to handle a few things first. Generate an offlineimap account password file. ps. Alternatively, see The homely Mutt's section to store password in macOS's keychain. # Load this python file. # After syncing, let mu index it. # Sync imap every 5 minutes. # Alternate between 10 quick syncs and full syncs. # Use function defined in .read_password.py to read the password. # Use the SHA1 fingerprint retrieved with openssl. Another option is executing lib/mk-ca-bundle.pl from curl's tarball to generate ca-bundle.crt, using certdata.txt from Mozilla's source tree. ENV["EMACS"] = "no" if build.without? "emacs"
(csetq mu4e-html2text-command "w3m -T text/html") ;; alternatively "textutil -stdin -format html -convert txt -stdout"
Encrypt ~/.authinfo with M-x epa-encrypt-file. Keep ~/.authinfo.gpg and delete ~/.authinfo. A Complete Guide to Email in Emacs using Mu and Mu4e. A year with Notmuch mail - a super-fast email client available on Emacs. areina's Manage your email in emacs with mu4e. Better Email with mu4e (NaN). Configuring Emacs mu4e with nullmailer, offlineimap and multiple identities. Drowning in Email; mu4e to the Rescue. Emacs as email client with offlineimap and mu4e on OS X.
Encrypt OfflineIMAP and msmtp password with GnuPG. GitHub - OfflineIMAP/imapfw: imapfw (IMAP/mail framework). Gmail Gnus GPG Guide (GGGG). Handling Email with Emacs (helm included). I got mu4e working! (Reddit). Installing mu and mu4e with homebrew with emacs. 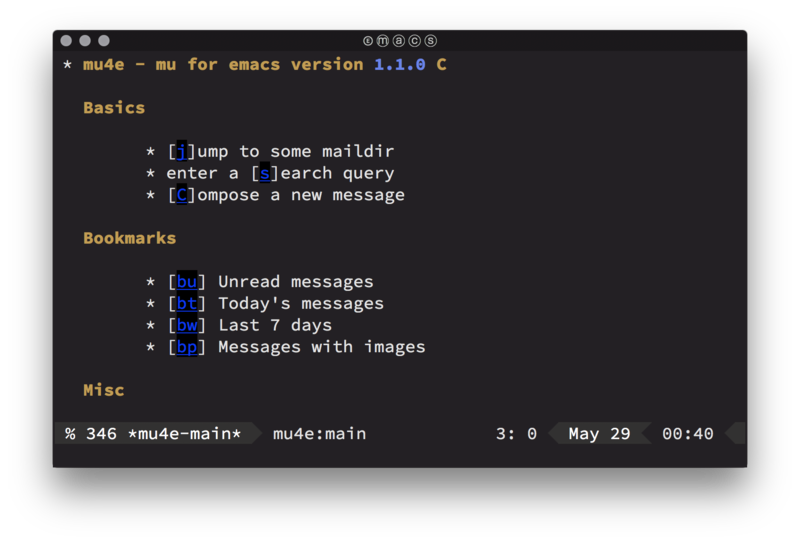 mu4e: an E-mail Client for Emacs. OfflineIMAP with SSL files on OSX - Sebastian Christ. OfflineIMAP: sync and backup tool for IMAP (Hacker News) and mbsync in comments. Practical guide to use Gnus with Gmail. Reading IMAP Mail in Emacs on OSX. The Emacs Network Security Manager. The Ultimate Emailing Agent with Mu4e and Emacs. TIP: How to easily manage your emails with mu4e (Reddit). Using Emacs to read gmail (Emacs subreddit).